2014 has already seen the final run of the Celebrate A Dream Come True Parade while the spring of this year will unveil the new afternoon cavalcade, Disney’s Festival of Fantasy Parade. This isn’t the first, nor will it be the last, transition between a classic, well-loved parade and a new procession that is destined to become just as timeless as its predecessor. In fact, let’s venture back to 2001 when the nighttime parades were in the midst of this type of changeover. In spring of that year, just as in the spring of this year, two parades were jockeying for heartfelt attention from Magic Kingdom guests. Walt Disney World sent out a single press photo saying goodbye to the standard-bearer of nighttime parades and welcoming in its replacement. 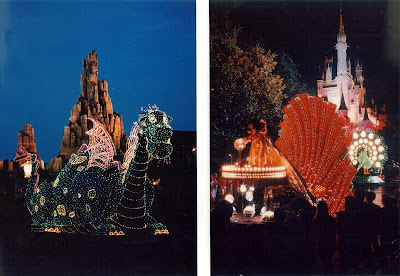 The two parades were none other than the Main Street Electrical Parade and SpectroMagic, the two of which have often played a game of switcheroo with one another, the latest of which took place in 2010. GOING, COMING -- It’s a springtime of transition in the Magic Kingdom at Walt Disney World Resort in Lake Buena Vista, Fla. Until April 1, 2001 – after more than 500 performances before hundreds of thousands of guests – it’s farewell to the “Main Street Electrical Parade” (left). On April 2, the popular SpectroMagic (right), a visual spectacle full of whimsical creatures, begins lighting the night to the delight of Magic Kingdom guests.